At Everclear Pool Solutions we can offer a wide variety of landscaping options to suit your design needs. The best swimming pool designs incorporate smart, functional and stylish landscaping, including plenty of greenery, non-slippery surfaces and creative zoning designed for different variations of poolside entertaining. Paving leading up to and surrounding your pool establishes the edge line in style. 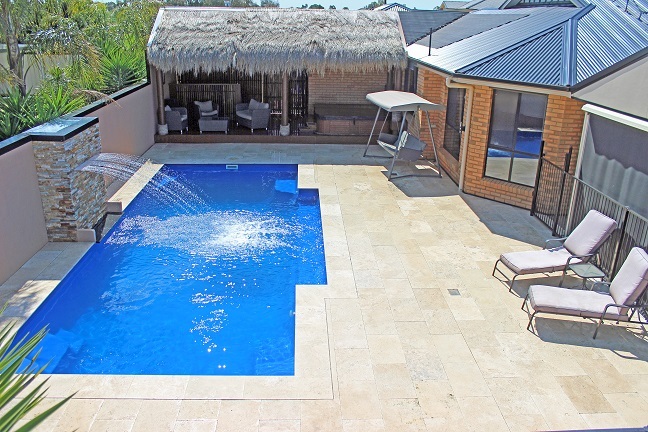 We love the range of natural stone coping and pavers for landscaping around pools. Natural stone easily picks up grime and dirt, foliage and debris, so be wary that you’ll need to pressure clean occasionally. Timber decking and stone paving may be the pool landscaping surfaces de jour, but rocks and overhanging palms forming a natural, tropical lagoon-like oasis are one of our favourite swimming pool landscaping ideas for the true escapist pool planner. Incorporating a spa into your swimming pool design is not essential – but will look amazing. This resort-like feature means you can enjoy your pool even in the winter months. Contact us to discuss Everclear Pool Solutions awesome design options.